The majority of countries in Europe (see the exceptions) use a type C ungrounded socket and either a type E or F grounded outlet. Type E outlets have a male pin which fits into a hole in the plug whilst type F, commonly known as Schuko, have two grounding clips on the sides of the plug. Plugs that will fit both types of outlet are common. A US to type C/E/F adapter will cover most of Europe (see the exceptions) but the supply is generally 230 V 50 Hz so you will need a transformer / voltage converter unless your devices are specifically marked as being compatible (look for a marking along the lines of 100 - 240V 50/60Hz which may be on the power supply). As we place more reliance on electrical items such as mobile phones, tablets and cameras than ever before it is becoming ever more difficult to find enough places to plug them all in. It can be particularly frustrating when older hotel rooms only give you one outlet and it is positioned out of reach behind a bed or under a table. The solution - get a multiplug adapter. These are a fantastic idea, the best ones are high quality, grounded, surge protected, have on board USB and allow you to plug up to six appliances into a standard extension strip - plenty of capacity for all of your gadgets. 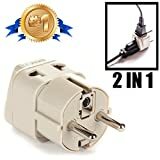 If you are traveling to multiple countries you may want to consider a universal adapter which will allow you to connect to a variety of different outlets. Some of the better ones include connectivity for Switzerland and Italy as well so can save you money if you are going on a European tour.